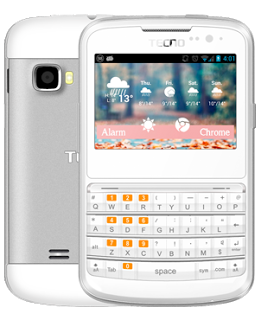 Tecno D1 is an upgrade to the Tecno Q1 with the newer Android 4.2 OS. Tecno D1 still features the same 2.6-inch touchscreen and a physical QWERTY keyboard and still targets consumers who love sharing and posting updates on social networking and chat services. The smartphone features a 2 megapixels camera, which may be underwhelming for some but is good enough for the target audience. The major selling point of the Tecno D1 is that it comes with the newer and more refined version of Jelly Bean, Android 4.2. The Q1 for comparison features the older Android 4.0 (Ice Cream Sandwich). The basic hardware is the same with a 1GHz dual-core processor and 512MB RAM. Tecno D1 features the same 2.6-inch capacitive touch display with 480 x 320 pixels resolution like the Q1. It also features a physical QWERTY keyboard. However, the rear camera has been downgraded to a 2 megapixels camera. Tecno D1 also features a 0.3 megapixels front facing camera. Where to Buy Tecno D1 in Nigeria. You can buy at leading online stores and phones stores nationwide. Tecno D1 price in Nigeria ranges from N16,000 to N21,000 depending on your location in the country.